Computer work has become the backbone of most of our daily lives. But with its rise in the workplace, there has been a concurrent increase in injuries associated with repetitive computer work, such as carpal tunnel syndrome and repetitive strain injury. 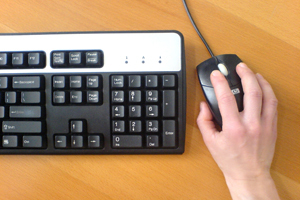 Incorrect usage of a keyboard or a mouse can be the culprit, since unnatural keyboard positions exert stress on the muscles, tendons and ligaments in the hands and wrists. An unsupported wrist can be the cause of wrist fatigue, and if your wrist is resting in the incorrect position, extensive typing, can pose a threat. When it comes to keyboards, a wrist rest is a good investment, since it's designed to give your wrists a break after typing for long periods of time. If you're typing incorrectly, it helps to alleviate the pain associated with repetitive strain injury or carpal tunnel syndrome. A good wrist rest helps to keep your wrists off the edge of the hard desk and can also help to prevent incorrect posture during typing. Before buying a wrist rest, make sure you know the height and width of your keyboard. There are many styles available on the market, and it's important to find the wrist rest comfortable for you. It needs to be the same height and width of your keyboard and it's key to find a wrist rest that conforms to the shape of your wrist. When placing the wrist rest against the edge of the keyboard, there shouldn't be a gap between the two. Adjust the position so that the wrist rest is set at the edge of the desk.